The runner-up in the second-fastest Kentucky Derby, Invisible Ink has been relocated to Pin Oak Lane Farm in Pennsylvania. He formerly stood at Rising Hill Farm in Florida. Vinery Stud’s Australian division has purchased a ‘major share’ in BC Juvenile Turf winner Pluck, virtually ensuring the colt will join his sire More Than Ready down under. 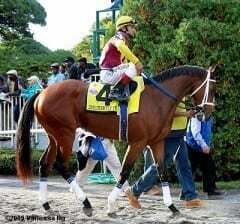 Pluck will be looking to run in France or Ireland before returning to the Breeders’ Cup in 2011. Barretts has cataloged 392 horses for its 2011 January mixed sale. The auction is located at the Hinds Pavilion at Fairplex Park on Jan. 24. With a $50,000 sale topper in Canadian champion Too Late Now, the Fasig-Tipton Texas December mixed sale posted increases in gross (25.5%) and average (22.2%) while median fell 24%. Ocala Breeders’ Sales Co. has announced 522 horses will be represented in their 2011 winter mixed sale. This number is up 5.2% over 2010. Breeders’ Cup Juvenile Turf winner Pluck will stand in Australia for Vinery Stud at some point in the next two years. The two-year-old’s racing future is still undecided. Team Valor-bred Pluck will join his sire, More Than Ready, on Vinery’s Australia shuttle roster. Three-year-old Jim Dandy winner A Little Warm and the winners of the past two Alcibiades Stakes, Wickedly Perfect and Negligee, are among the entries in Keeneland’s next month’s mixed sale, January 10-14.